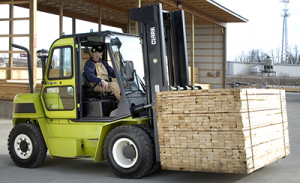 The highest capacity forklift truck Clark offers is powerful, smooth and exceptional in design and practicality. The diesel or LPG engine, fully automatic three-speed transmission and wet disc brakes create the optimal lift truck. Its pneumatic tires, high lifting capacity and rugged frame are ideal for heavy manufacturing, stevedoring, lumber and building materials handling. Nested I-Channels cradle cylinders, hoses and chains so the operator has the best front view possible. The hydraulic cushioning minimizes shock and vibration for the truck. The 6 rollers manage load distribution and reduce free play. Power-assist design is ergonomic for operator comfort. This forklift is available for sale or lease. Contact a Forklifts of Toledo Sales Representative for pricing and additional information.